• This is the third of the 5 shapes--just 2 more to go! • Note that on the D (4th) string you should use your 4th finger instead of your 3rd finger. This makes it easier to shift in and out of the new position. 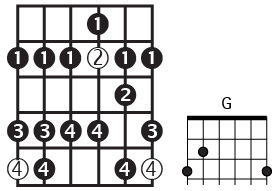 • Don't worry if you can't play the "G" Shape barre chord up on the 10th fret like I do at the beginning of the video--it's not really a chord you would ever use! • You have to shift your hand down a fret at the G string.